The field configurable SMSC Series isolators offer wide ranging input and output capability for scaling and transmitting analog DC signals. The SMSC Series will accept input voltage spans from 10 mV up to 100V, as well as input current spans from 1 mA to 100 mA. The input zero and span potentiometers enable 50% input zero and span adjustability. For example, the 0 to 10V input range can be elevated to 5 to 10V, compressed to 0 to 5V or set to 2.5 to 7.5V. The SMSC Series offers four (4) popular output ranges: 0 to 5V, 0 to 10V, 0 to 1 mA and 4 to 20 mA. The 4 to 20 mA compliance is a powerful 20 Vdc. The SMSC Series can be configured to accept bipolar input ranges and offers selectable normal or reverse acting operation. The SMSC series is a 3-port industrial isolator–the output(s) are optically isolated from the input(s) up to 1500 Vdc. The ASIC-based I/O channel(s) are independently transformer isolated from the selectable 120/240 Vac power supply. The SMSC Series field configurable isolators are useful in eliminating ground loops, converting signal levels and providing signal drive and redundancy. The wide ranging capability of the SMSC Series provides quick universal spare part coverage. 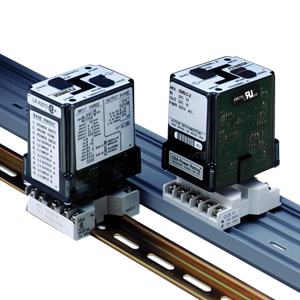 The SMSC Series is equipped with a dual function LED signal monitor. The green, top-mounted LED indicates line power and input signal status. Active line power is indicated by an illuminated LED. If the input signal is 10% more than full scale range, the LED will flash at 8 Hz. Below 0%, the flash rate is 4 Hz. The factory presets the SMSC Series input(s) and output(s) to 4 to 20 mA. The supply power is configured for 120 Vac operation.